Growing up I always loved going to my aunt Sheila’s house because she made delicious homemade flour tortillas. They were soft, flavorful, and fresh off the stove, much better than you could buy in the grocery store. She didn’t use a recipe, so I was never able to re-create her masterpiece. Luckily my cousin December has come up with a recipe, so I can finally make fresh tortillas too. In a large mixing bowl, combine the flour baking powder and salt. With a fork cut in the shortening until well incorporated. 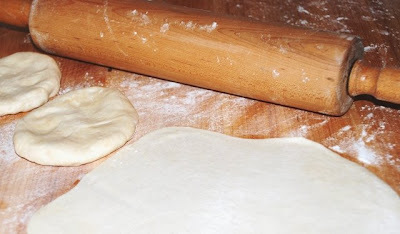 Add the water and continue to mix with a fork until the dough comes together, lightly knead the dough incorporating enough flour to form a soft, barely sticky dough. You will have extra flour, so don’t overwork the dough and make it tough. 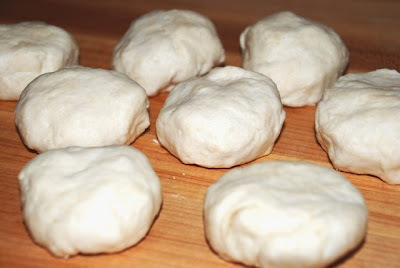 Divide the dough into 2 inch rounds, cover with a towel and let rest for 10-15 minutes. Lightly flour a board and roll out the tortillas to about 1/8 inch thick. Cook tortillas in a heavy skillet over medium high heat until lightly browned on each side, about 1 minute. Keep wrapped in a towel while cooking other tortillas to keep warm. I used a seasoned hamburger and my yummy tomato cucumber salsa to make tacos. I can’t really call this a recipe, but here is how I make the meat. Fry one pound of hamburger until browned, drain fat. Add one 15 ounce can tomato sauce, 1 tablespoon chili powder, 1 teaspoon cumin, and salt & pepper to taste. Cook over medium heat until sauce thickens and serve. No tortilla press? 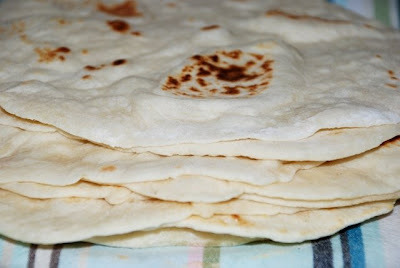 Wow -- I'm impressed with how thin you've made your tortillas -- they are gorgeous. Well done your cousin for coming up with the recipe, and well done you for trying it. Your tortillas look very impressive. Yum. 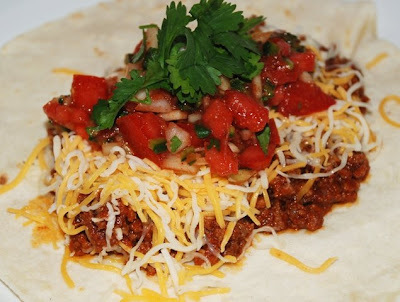 I've never made my own tortillas but they look fairly easy. Thanks for the great recipe.